Alabama’s waiver from No Child Left Behind accountability measures is up for renewal. The Alabama State Department of Education has posted it online and given the public until March 31, 2015, to comment on the proposed changes. 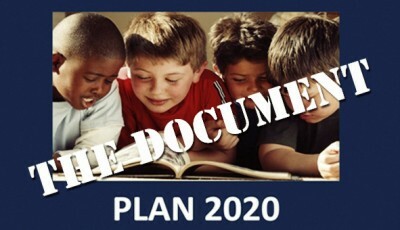 A 3-page document outlining the changes from the initial waiver, approved in June 2013, was included in a packet of information given to attendees of the March 12, 2015, state Board of Education work session, but the changes contained in the 3-page document were not discussed in any detail. Here is that 3-page document. UPDATE, March 18, 1:40 p.m.: The ALSDE was kind enough to clip out the highlight of where the ESEA waiver was discussed during the March 12, 2015, work session. 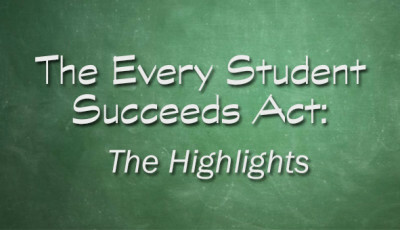 The waiver, also known as the ESEA (Elementary and Secondary Education Act) waiver, released Alabama’s schools from the pass/fail method under Adequate Yearly Progress measures in exchange for state-developed methods of accountability. I am still looking through the waiver renewal and have lots and lots of questions, but wanted to get this out to readers as soon as possible. One of many changes is that all references to the state-mandated A-F grading system have been eliminated from the waiver. Initially, State Superintendent Dr. Tommy Bice wanted to have only one accountability system and therefore put all plans for Alabama’s state-level accountability system in the waiver alongside federal requirements. State education officials have now indicated they plan to keep those two accountability systems separate. The way Annual Measurable Objectives (AMOs) are calculated is changing. 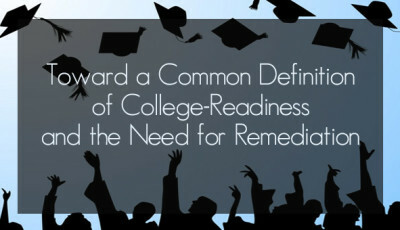 AMOs are extremely important and set expectations for each “subgroup” under the ESEA. The AMO bar appears to be even lower than it was in the first waiver request from 2013. The method for setting “rigorous” AMOs begins on page 69 of the waiver renewal (page 75 of the PDF). Until multiple years of results are available for ACT Aspire results, full sets of AMOs (by school and by district) will not be able to be set. o Meet or exceed the state average from the 2013-2014 data. o Show improvement equal to the improvement of the state. o Reduce the percentage of non-proficient students by ten percent from the previous year’s data to meet its AMO for each subgroup. Look for much more on this in the coming days. It appears some new attachments are missing (here’s where all of the original attachments are), but hopefully they will be posted soon. For now, we have two weeks to put our concerns on paper. Use the time wisely. 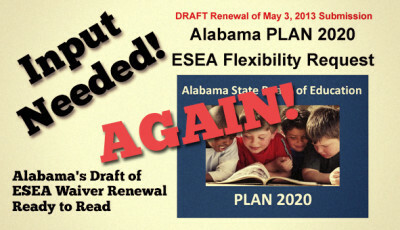 Click here to view the Alabama School Connection’s three-part series (Part 1, Part 2, Part 3) about the ESEA waiver when it was initially approved. This post was updated on March 18 to clarify that while the actual changes in the ESEA waiver renewal were not discussed in any detail during the March 12 board work session, the topic of the ESEA waiver renewal itself was discussed. 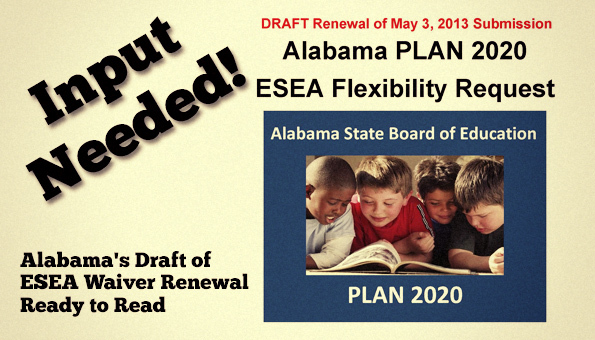 The video capturing the ESEA waiver renewal discussion during the March 12 work session was embedded as well.